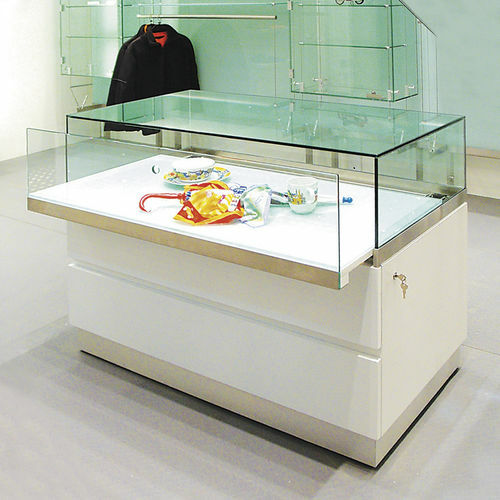 Shopkit can design, manufacture and install a variety of different styles of sleek contemporary glass display counter cabinets to suit various applications, including retail interiors, shop in shops, office receptions, museums and hospitality environments. Each glass display counter cabinet can incorporate different features and functions such as a gliding pull out display drawer or lockable sliding doors to access the display area within the cabinet. They can also include lockable under counter storage drawers or cupboard storage areas, as well as low-voltage halogen or LED lighting. By working with our experienced design and manufacturing teams Clients’ specifications can always be met to produce the best solution for each environment.